Among the novelties of the Martinique Surf Pro 2018 (from March 17 to 24), the competition is open to women and will welcome nearly 50 female pro surfers alongside a hundred surfers on the spot of Basse-Pointe. The MSP (Martinique Surf Pro), scheduled for March 17-24, 2018 in Basse-Pointe, is “an international competition that will bring together the best surfers in the world,” announced the two founders, Nicolas Clémenté and Nicolas Ursulet. With two competitions, a men’s, bringing together 110 athletes, and a women’s, the MSP will gather for the first time, no less than 160 athletes. 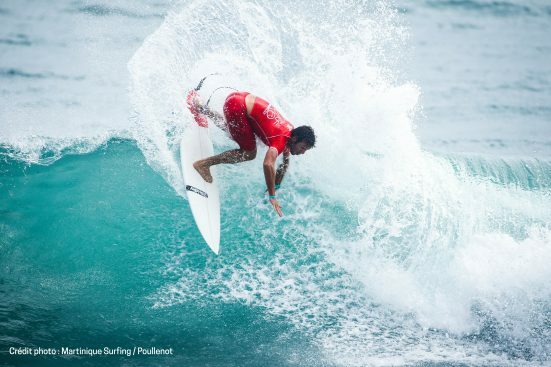 Organized in partnership with the World Surf League (the professional international surf league), Martinique Surf Pro is the first Caribbean stage of the Qualifying Series (QS) and the only one of the French West Indies, which is held on a spot that attracts competitors. “With its cliffs and rocks, the spot of Basse-Pointe charms by its authenticity, its nature side but also by its proximity to the public. Its configuration allows the spectators to be really in the heart of the competition and not to miss anything the show offered by the competitors on the water. Also, the wave in Basse-Pointe is a great, long point break wave that allows the surfers to express themselves to the fullest.” – said Clémenté and Ursulet. Until now, the public settled on the beach and rocks. This year, the organizers have decided, for this 4th edition, to offer “more comfort to the spectators with real seats and misting on a larger part of the site”. “The competition is a leading tourism promotion tool for the destination Martinique and its nautical potential,” they add. The Martinique spots are thus more and more popular with amateurs coming from all over the world.